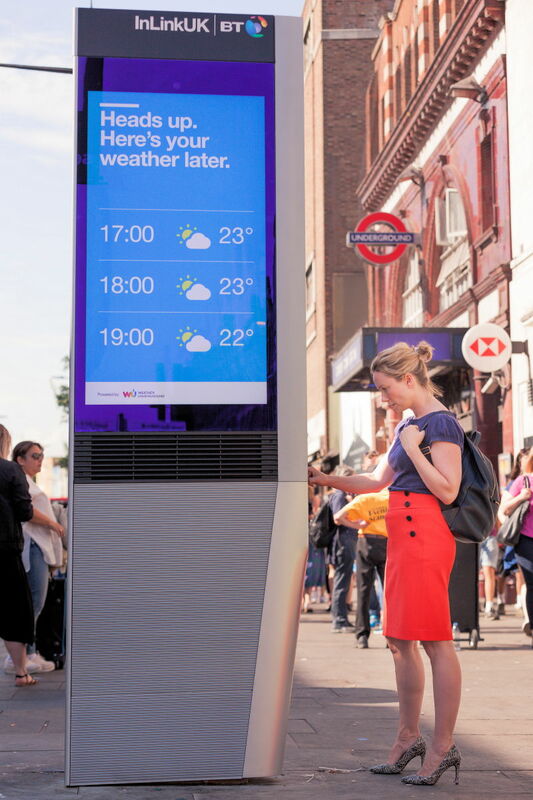 Telecoms operator BT has today switched on the first of their new InLinkUK (formerly LinkUK) smart kiosks in London, which will be able to offer free Gigabit public WiFi, free UK phone calls, USB device charging and a range of other digital services to help people passing within the vicinity. 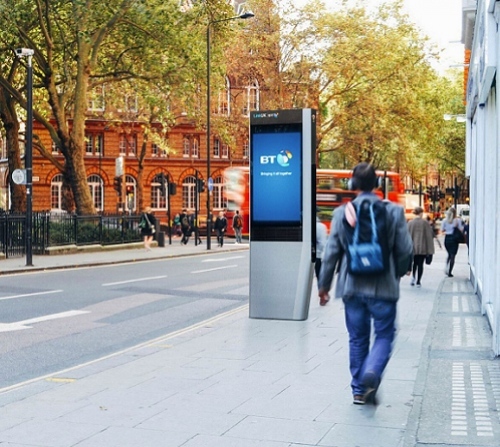 The new InLinks, which were first announced last year as part of a partnership between BT, Intersection (LinkNYC) and advertising company Primesight, will eventually replace over 1,000 pay phones in major cities across the United Kingdom. Funding for the kiosks is expected to be extracted via revenues from advertising on the kiosk’s large 55″ HD digital displays. The kiosks take up less pavement space than a traditional payphone box and also include special sensors, which can capture real-time data relating to the local environment, such as air and noise pollution, outdoor temperature and traffic conditions (useful info. for local councils and communities). “This is the phone box of the future. InLinkUK from BT brings the payphone up-to-date and gives people the services they need and use every day in the 21st century – and the bonus is it’s all for free. But as well as the free services – ultrafast Wi-Fi, phone calls, rapid mobile charging and local information – councils and community organisations will be able to use the screens to provide up-to-the minute news and information to local residents. The first of these new kiosks are now live on Camden High Street and many more should follow over the next 12 months in central London, as well as around other major cities. Give all this to what tourists and put it in areas that are already swamped with GB speeds. And leave the rest of us on third world speeds. After having used a Link NYC, i can say these devices are fantastic and its finally nice to see the UK getting with the times! Any negative comments here are due to poor broadband speeds where they live, cities are always bound to have better coverage! How about no Broadband or mobile signal at all! I think the only sort of kiosk most people in the UK want is the sort that Dr. Who uses, that enables them to travel backwards in time. Where I live we don’t need a tardis to go back in time – we can just look at our 20CN ADSL telephone exchange and broadband speeds that haven’t improved since 2006. The only thing that has changed is the price we pay which has risen considerably. http://www.ispreview.co.uk/index.php/2017/03/southwark-first-benefit-free-1gbps-wifi-bts-linkuk-kiosks.html That clearly said Camden had these already almost a whole year ago. Are the BT submitters now feeding the site recycled tripe? Can you read? That article is from March (I’m not sure how 3 months is ‘almost a year’) and says that these boroughs ‘will be the first to benefit’. I’m guessing you’re a facetious BT hater rather than just stupid? Thats 8 months old so close to a whole year. He also has a point how is this news if Camden had them 3 months ago? Why report the same thing again? It seems the BT trolling has hit a new high here. What’s wrong with writing an article when something goes live? Where does it say that Camden has had them for 3 months already? It does not state anywhere that they were already rolled out and live in Camden 3 months ago. If you don’t like Mark’s articles here, then you’re more than welcome to leave the site. A user named Lana Preston in the comments of that story back in March also claims to have used one back then. Visiting http://www.inlinkuk.com/find-an-inlink.html also shows it as already live in Camden. I trust 3 pieces of evidence is enough for you. OK, there is no such thing as a free lunch. What’s the catch here? well there is a surprise. a bt article and mr newton makes an appearance with his usual anti-bt remarks. He did not even mention BT in his comment. Because it offers gigabit wi-fi? I imagine it has a gigabit backhaul circuit and is offering AC1300 or AC1700 WiFi. Which isn’t gigabit speeds, the maximum throughput will fall well below 1000Mbps, even in a perfect environment. Yet another false advertisement by the big boys. InLink’s Wi-Fi network is most likely the fastest you’ve ever experienced, with speeds up to 1 gigabit (1,000 Mbps), with no data caps or annoying ads. Will I always receive a gigabit of bandwidth when I access the network? There are many factors that impact the real bandwidth available to a connected device. Among these are the number of devices connected, client device performance, radio interference in the environment from wireless or other electronic devices, and the speed of the services being accessed. Rarely will an individual device be able to access a full gigabit, but by providing a gigabit network we are ensuring the best possible performance for all clients. 3) Intersection (the company behind the units) is the one that markets them as gigabit wifi. If you have some issue with that, take it up with them. The ASA and Ofcom require any “UPTO” quoted speed is available to 10% of users. If 20 are connected will 2 of those get 1 gigabit speeds? Nothing is being sold so I don’t think the ASA rules would apply. @PaulM – you may be surprised to know that all users are not using the internet at full speed all of the time. Being sold or not has nothing to do with it. The ASA and CAP covers all advertising. An example would be an advert in a paper from say a dogs home asking you for people to rehome dogs ITS NOT selling the dog but its still subject to advertising rules. BT breaking the laws of the physical world and connecting “HUNDREDS” over wifi and at “FASTEST” speeds. I trust that is enough again for you? PaulM: You clearly seem to have your knickers in a twist over anything to do with BT. The trolling of BT articles is childish and pathetic. If you are so unhappy with these new InLinks, then complain to the ASA but I can assure you it won’t go very far. Press releases and other marketing articles are outside of the ASA’s remit (Code 2/J). I have no issue with BT had my landline with them for years. I only answered a persons question. I think the BTlinks are a good idea, the claims they are capable of are another thing entirely. Im sorry if you have an issue with the claims of a service being discussed. My point was simply to point out that “Gigabit public WiFi” in this case, unless it can be proven otherwise, cannot achieve a real-throughput of 1000Mbps to any one client. I think that there will be many caveats when it comes to defending the figures but what do you do. It’s like saying an FTTC cab is Gigabit to all users as its fed with Gigabit capacity however the technology feeding the individual clients isn’t. Gigaclear is a FTTP provider, not WiFi. The point is the same – you cannot reach 1000Mbps upload/download with Gigaclear due to overheads. BT are not advertising this as a 1Gig wifi service, so I cannot see why people have a gripe with it. There is a distinct difference between service overheads, and complete fantasy. “Telecoms operator BT has today switched on the first of their new InLinkUK (formerly LinkUK) smart kiosks in London, which will be able to offer free Gigabit public WiFi” either the news article is wrong or the source information is if that’s the case. There is nothing wrong with the article or source. I hope its a bit better than all that gear if BT reckon on “HUNDREDS” being able to connect to it. Let’s keep calling copper fibre too. Sigh, I give up. Yes, I suggest you take a break and don’t let BT worry you so much…. Do you realise how ridiculous most of you sound? Get a life , or go and hate your friends or something. The uk public are utterly pathetic when it comes to broadband. Deal with it, if you can’t, go and do something about it , if you can’t be arsed then go and join an arm wrestling competition somewhere and if you win get a t shirt made, hate the bloody lot of you. Ooooer someones angry its not a love fest in comments discussing a service. Unfortunate for people who have one installed outside their home…as in my case…. with its open ‘speakerphone’ to the street..I have the phone ringing all through the night as the local unsavoury types make full use of it to the disturbance of the nearby residents…. who thought that was a good idea…I bet they don’t have one outside their home.